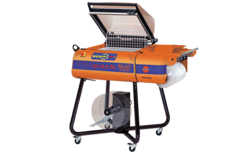 We are offering shrink wrapping machines. From now on, the size of the products is no more a limit thanks to UNIKA 50. Products of big and small dimensions and, most of all, of an unlimited length could be packed thanks to the exclusive independent sealing bar system, which overcomes the now old concept of “unique L-loom”. • Adjustable belt speed by inverter. • Automatic control of the switch-on functions. • Visible and acoustic emergency signal. • Integrated and movable roll support. • Receiver for compressed air. • In-feed and out-feed electronic door to interface any additional feed belt. • Machine placed on adjustable feet and wheels. • New micro-puncher kit with adjustable tensioning film • Possibility of packing single or multiple packages. • Full waste winder and end roll alarm device. • Control panel with graphic touch screen interfaced with USB doo. Poor shrink package quality is often the result of non-intuitive mechanical adjustments, dependence on precise time, speed and temperature control and changes in seal quality due to dirt and/or film build-up. Thus, SW-Series™ Shrink Wrappers are designed to sort out all such aforesaid problems. Exclusive range of our SW-Series Shrink Wrappers are best to eliminate many of the common shrink film wrapping problems that often result in poor package quality. 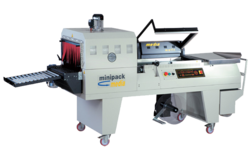 • Simple, intuitive mechanical adjustments make our shrink wrap machine easy for operators to set up. • Extra large operating sweet spot for time, speed and temperature control significantly improve "first out" quality. • SW-Series Shrink Wrap machines have successful track record to improving the productivity levels by reducing rework due to poor package quality and preventing downtime associated with time consuming changeovers. 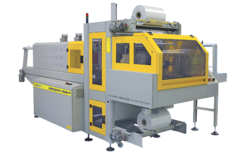 We offer Semi-Automatic Shrink Wrapping Machines and Tunnels. The semi automatic angular machines of the modular series apply to all companies where packing flexibility, product quality and limited investment are fundamental parameters. Technically and aesthetically updated in recent times, the modular series can offer excellent performances with any kind of packing material (polythene too) thanks to the self-regulating electronically controlled temperature sealing system and the most advanced safety systems. The possibility of an automatic or semiautomatic operation in combination with the possibility of customizing the 6 programs make modular a user-friendly and high-output machine, also thanks to the built-in (standard) film rewinder and the possibility of perfectly interfacing with the new tunnel 50 and tunnel 70. We have four models of Chamber Machines designed for customers with different production needs to reach an optimum ratio price/performances and reliability in time. Different production requirements are satisfied by the four distinct chamber machines models. Standard shrinking magnet assembled on machine, washable stainless steel lower chamber to grant better hygiene in foodstuff packing, six working programs available directly by the electronic control panel that drive all machine functions (and automatically adjust sealing time, avoiding fumes caused by sealing blade overheating), sealing by adjustable impulse blade, security thermostat with warning signal to find out troubleshooting, sliding trolley and adjustable working surface, film micro puncher, motorized winder, are the features of FM range. Two working possibilities (sealing only or sealing + shrinking). 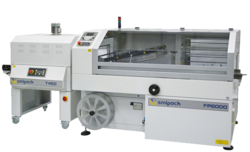 Modularity and excellent price/quality ratios are the main features characterizing the fully automatic sealers of the FP series. All the models of this range can indeed be supplied with or without shrink tunnel. The FP series of modular sealers with shrink tunnel includes different models, for outputs ranging up to 6.000 packs/hour. We understand that outer appearance of the product plays a vital role in marketing the product, hence special attention to the packaging must be considered as primary requirement. ST-Series™ shrink tunnels utilize a "soft convection" shrink packaging process in an efficiently designed chamber that uniformly bathes the film bubble with hot air. Users are reworking 10-30% of their packages and production lines are running well below their rated capacity. Equipment is constantly in need of repair and many attempts are made by customers to modify their machines in order to overcome technological issues. The ST-Series shrink tunnels utilizes a "soft convection" shrink wrapping process in an efficiently designed chamber that uniformly bathes the film bubble with hot air. Automatic Sleeve Wrapping Machine with shrink tunnel is designed for packing single product or combined products without tray. 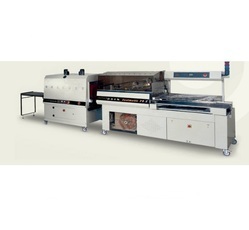 The equipment can be connected with the production line to complete feeding, film wrapping, sealing & cutting, shrinking and cooling automatically. There are various packing modes available. For combined object, the bottle quantity can be 6, 9, 12, 15, 18, 20 or 24 etc. 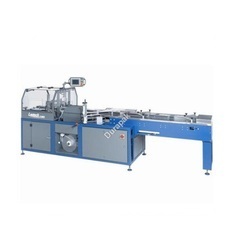 Automatic sleeve sealing machine is designed based on advanced technology and artwork introduced from abroad to ensure stability and reliability of equipment. Adopt Mitsubishi PLC to achieve light, mechanical, electrical and instrumental integration. The conveying belt can be set for left feed-in or right feed-in as required. Adopt specially-designed sealing cutter for perfect sealing without cracking or film sticked to the cutter; the conveying belt is made from “LFPOM”, characterized by toughness. The machine can pack 2, 3 or 4 rows of bottles with or without tray. Only need to turn the switchover switch on the panel when you wants to change the packing mode. Adopt the worm gear reducer, which ensures the stable conveying and film feeding. Choose vibrant feeding device according to the shape of bottle. 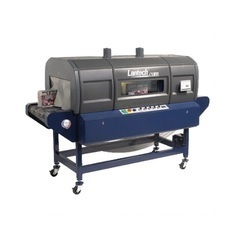 For packing colored films, the machine needs to be equipped with the whole set of photocell detection device in order to ensure accurate positioning. Module type design, quick changeover. Adopt double blowing motors to guarantee even heat inside the tunnel, which leads to good appearance of package after shrinking. The adjustable hot air guide flow frame inside the tunnel makes it more energy-saving. Adopt solid steel roller covered with silicone gel pipe, chain conveying, and durable silicone gel. Adopt stepless conveying speed regulation controlled by transducer. An aluminum roller table can be connected with the shrink tunnel for loading the products after shrinking.